After having perfected the art of ice cream here and a competition being set here I knew exactly what I wanted to do for my next ice cream flavour. 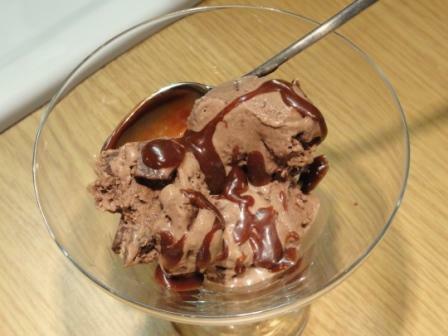 I am a chocoholic and my favourite ice cream is triple chocolate ice cream – chocolate flavour, with chocolate chips, and a chocolate sauce running through it. So, what better thing to do at home than make it myself? I started by making the chocolate sauce and then went on to making the ice cream. I’d skip this, but my daughter and husband would be in heaven. Have a great week, Tandy. have a super week as well!